Exlar Actuators Solutions from Allied Automation, Inc. 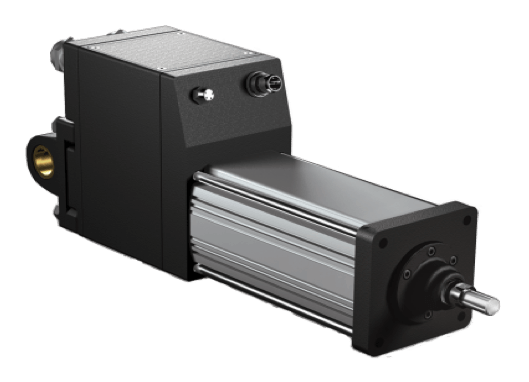 Integrated servo motor and roller screw actuator solutions with feedback, connectors, and wiring configured to almost any brand of position controller for a true “plug and play” risk-free. By combining the latest electronic power technology with advanced thermal management modeling technology, Exlar’s has set a new benchmark for electric actuator performance versus size. The Tritex II Series actuators integrate an AC powered servo drive, digital position controller, and brushless motor in one elegant, compact, sealed package. Now you can distribute motion control and solve your application with one integrated device. Simply connect AC power, I/O, communications and go! By combining the latest electronic power technology with advanced thermal management modeling technology, Exlar’s has set a new benchmark for electric actuator performance versus size. The Tritex II Series actuators integrate an AC powered servo drive, digital position controller, brushless motor and linear actuator in one elegant, compact, sealed package. Now you can distribute motion control and solve your application with one integrated device. Simply connect AC power, I/O, communications and go! 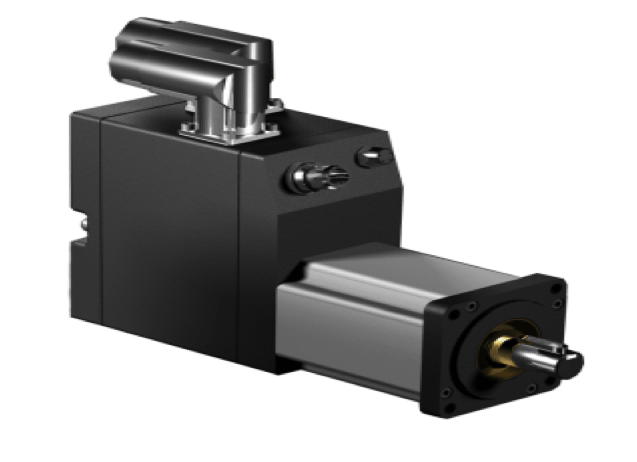 By combining the latest electronic power technology with advanced thermal management modeling technology, Exlar has set a new benchmark for electric rotary actuator performance versus size. 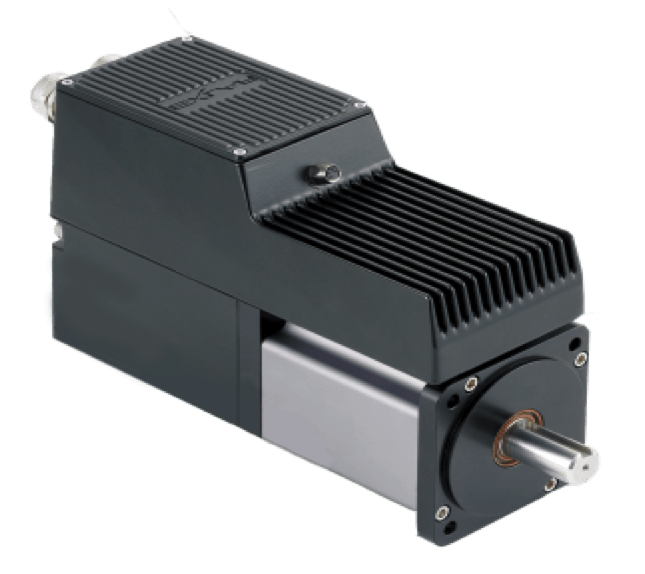 The Tritex II actuators integrate a DC powered servo drive, digital position controller, and brushless motor or gear motor in one elegant, compact, sealed package. Now you can distribute motion control and solve your application with one integrated device! Exlar’s newest product offering features the Tritex II DC powered unit, housing the servo drive, digital positioner and electric actuator all in one convenient package. 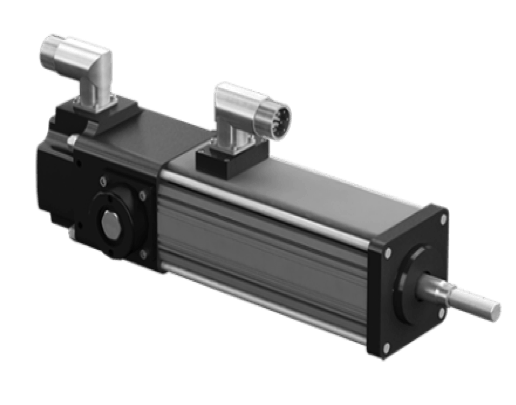 Tritex II actuators are the highest power density, smallest footprint servo drive devices on the market allowing you to incorporate a fully electronic solution in the space of your existing hydraulic or pneumatic cylinder. You can also eliminate troublesome ball screw actuators or bulky servo gear reducers. And the space previously consumed by panel mount servo drives and motion controllers is no longer needed. Tritex II electric actuators may also reduce the size of your machine design while offering significant reliability improvement. GSX Series linear actuators combine the advantages of Exlar’s roller screw technology and T-LAM stator technology to create a powerful and robust linear solution. Exlar uses a specially designed roller screw mechanism for converting electric motor power into linear motion within the actuator. Planetary rollers assembled around the actuator’s extending rod follow threads which are precisely machined on the inside surface of the actuator’s hollow armature. Linear motion is produced in precise synchronization with the armature rotation. 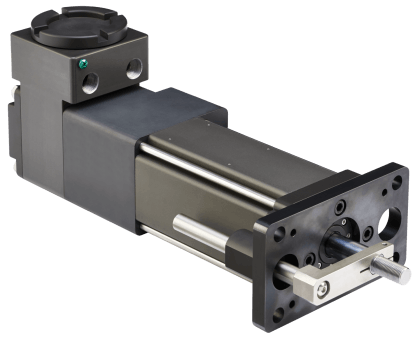 Because this roller screw mechanism has an inherently larger cumulative contact surface, these actuators have a much longer working life, and can handle heavier loads at higher speeds than is possible from a similarly sized unit built around a ball screw system. 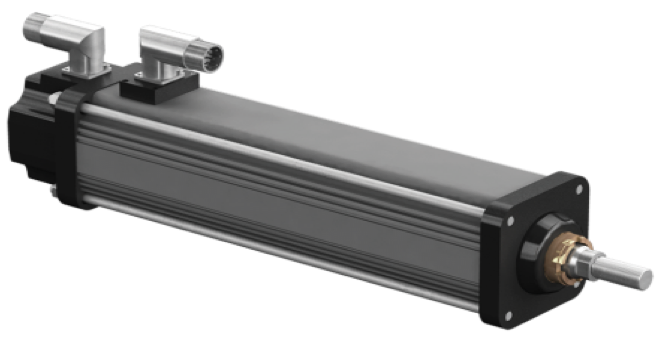 The GSM Series of linear actuators from Exlar provides a cost effective solution, perfect for replacing ball screw actuators. 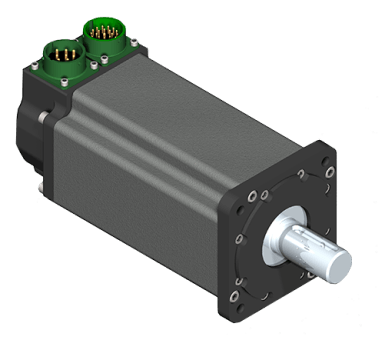 This compact design incorporates Exlar’s patented roller screw technology with an integral brushless servo motor for medium to high performance motion control applications. The GSM Series offers a completely integrated actuator, competitively priced with low performance, short-lived ball screw actuators. The GSM design provides a smaller package with higher speed and load capacity than ball screws and other traditional rotary to linear conversions. GSM Series also offers 5 times the travel life of similarly sized ball screw actuators. 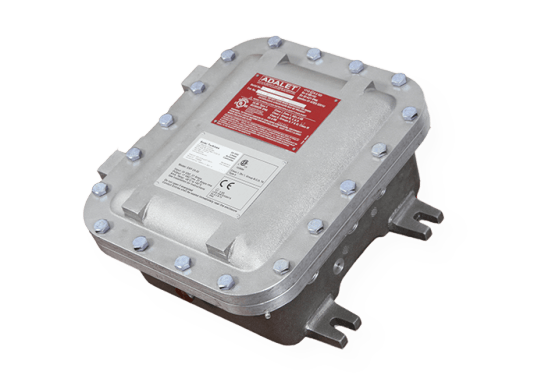 Selection of the proper feedback configuration allows GSM Series actuators to be powered by nearly every brand of brushless motor amplifier on the market. 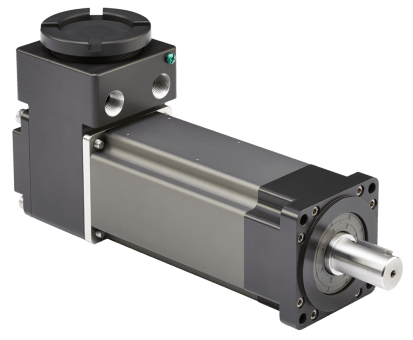 This flexibility allows GSM Series actuators to be incorporated into the highest performance single and multi-axis motion control systems in use today. 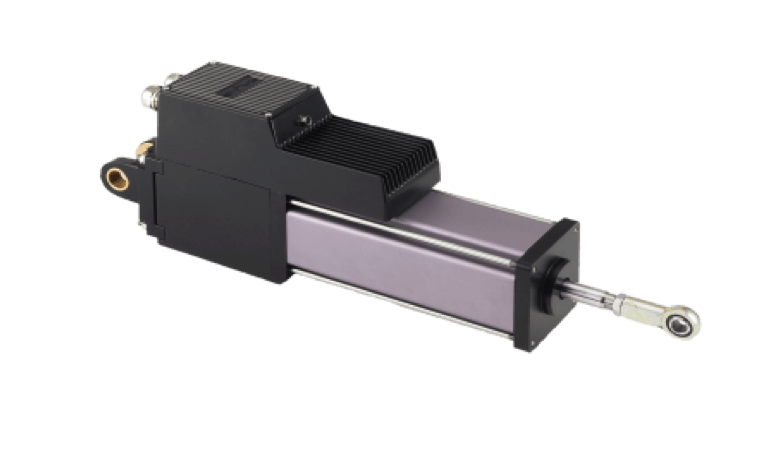 In applications varying from food and beverage packaging, to multi-axis turning centers to air-craft assembly, the GSM Series of actuators show incredible performance and durability. GSM Series units can be used in advanced closed-loop servo systems when velocity and positioning is required. Position feedback can be delivered in a number of different forms including resolvers, encoders or internally mounted linear position feedback sensors. GSM Series actuators interface with nearly any servo amplifier on the market. The K Series actuators from Exlar provide a truly universal solution for rod style actuator applications. Now available in 60, 75 and 90 mm frame sizes, this series offers the option of two grades of planetary roller screws along with an option for an ACME screw. These multiple grades of screw type allow you to select the configuration best suited to your application and budget. 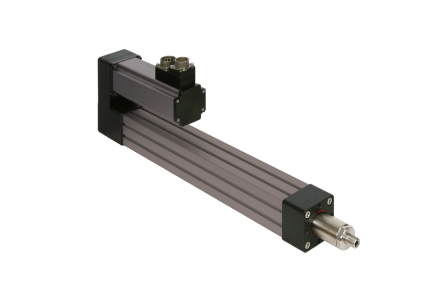 The K Series provides an ideal replacement for pneumatic cylinders, with dimensions and form factor consistent with ISO Metric pneumatic cylinder specifications. 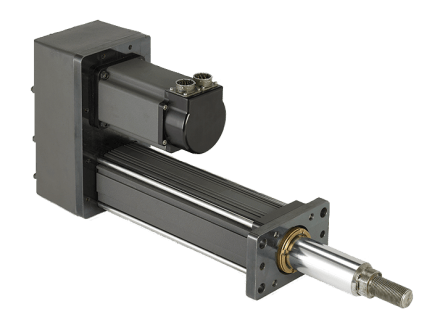 The availability of high performance planetary roller screw drive allows the K Series to also replace hydraulic cylinders and provide a solution that offers superior life and performance to ball screw actuators. Exlar FT Series uses a roller screw mounted inside a hollow force tube mechanism. The follower is attached to the moveable force tube, which then extends and retracts as the screw rotates. The FT Series is designed to be compatible with a wide variety of standard motors. Motor mounting and gearing configurations are available to meet nearly any applications requirements. The standard product offering includes four frame sizes with strokes from 6 to 48 inches and a load rating up to 40,000 lbf. The UL Recognized, Exlar SLG Series gearmotors offer you one of the highest power densities available in motion control. Currently the SLG gearmotors are available in three frame sizes, 60, 90 and 115 mm frames with 1, 2 or 3 stack lengths. Single and double reductions are available in 4:1, 5:1, 10:1, 16:1, 25:1, 40:1, 50:1, and 100:1. Their unique design is especially valued in applications where weight or space is at a premium. EL30 actuators are rated for Class I, Division 1, Groups B, C and D. The “Class I” classification means that flammable gases or vapors may be present in the air in quantities sufficient to produce explosive or ignitable mixtures. “Division 1″ means that hazardous concentrations in the air may exist continuously, intermittently, or periodically under normal operating conditions. “Group B” allows for atmospheres containing hydrogen, or gases (or vapors) of equivalent hazard, such as manufactured gas. “Group C” allows for atmospheres containing ethyl-ether vapors, ethylene or cyclopropane. “Group D” allows for atmospheres containing gasoline, hexane, naphtha, benzene, butane, alcohol, acetone, benzoyl, lacquer solvent vapors, or natural gas. EL Series actuators are not rated for operation in atmospheres containing acetylene. ER Series motors are rated for Class I, Division 1, Groups B, C and D. The “Class I” classification means that flammable gases or vapors may be present in the air in quantities sufficient to produce explosive or ignitable mixtures. “Division 1″ means that hazardous concentrations in the air may exist continuously, intermittently, or periodically under normal operating conditions. “Group B” allows for atmospheres containing hydrogen, or gases (or vapors) of equivalent hazard, such as manufactured gas. “Group C” allows for atmospheres containing ethyl-ether vapors, ethylene or cyclopropane. “Group D” allows for atmospheres containing gasoline, hexane, naphtha, benzene, butane, alcohol, acetone, benzoyl, lacquer solvent vapors, or natural gas. ER Series motors are not rated for operation in atmospheres containing acetylene.